The following image is not really photography, but was done with X-rays. I have been prescribed a CT scan lately and was given the data on a shiny CD-ROM. The data is a set of files in a format called "dicom" and the CD comes with a Windows program, which, when one uses a MS Windows computer, displays slides of the scan in no really useful way. Obviously, the operator of the machine had a much better program, although I should say that it was not really obvious to me what his screen displayed either. That is probably why he is a medical doctor and not me. Anyway, to cut the story short, let us just say that I had some motivation to make better use of that data on the CD. Of course, it is not a photograph as the process to come to that image is as remote to photography as could be. But the software allows us to see the data as if it were a photograph, because that is how the data is most understandable to us (untrained us, that is; radiologists may be of a different opinion): computational photography. Excellent picture, Jerome and I hope whatever reason you had for the CT scan proves trivial and transient! Wish you a full recovery! This is true photography as it’s writing with light, not much different from using daylight in an ordinary camera. Again, with many views from different angles, (and having brilliant Agisoft software), one can use a Mac or PC to reconstruct the 3D form, which again can be rotated and viewed from any aspect you desire. The principal difference is that the light, (considered as electromagnetic waves), has an extraordinary energy and needs to be shielded to protect humans! 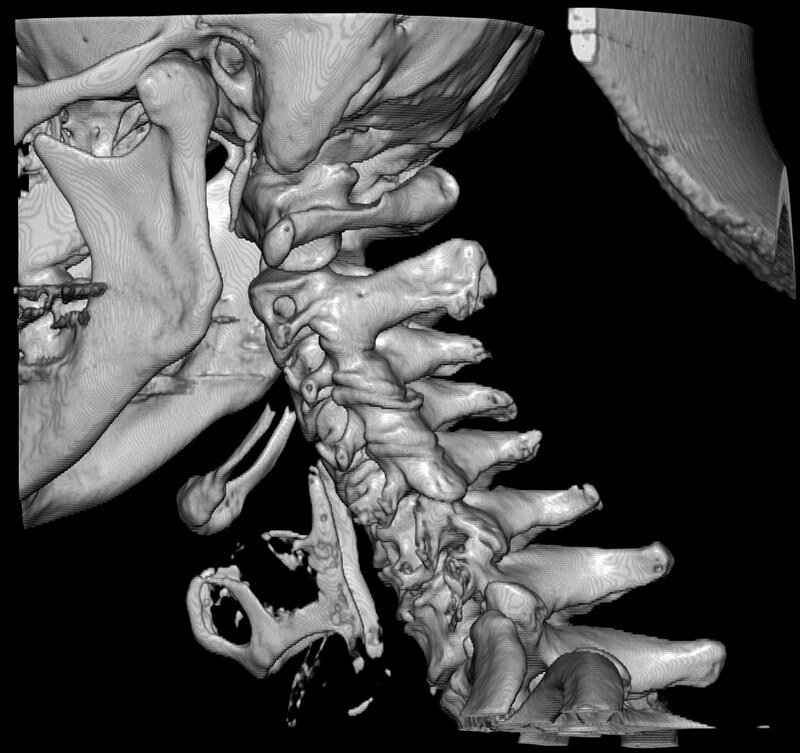 Your 3D model of the neck is great advance indeed. But the math is only about 35 years old! I was fortunate to have trained my brain with 3 D models of the DNA helix to think in terms of theoretical 3D structures, to the extent that I was able to look at CT scans like this and add up sequential slices through the head and build in my mind a rotatable 3D model of the patient’s cancer in the throat, so I could work out how to devise a radiation treatment approach. I wasn’t able to do more than approximate in my mind the adjacent structures to the same level, but my intuitive skills limited to the tumor volume was amazingly predictive of the computer calculated results which came years later. Today, one can add color according to Houndsfield units, or density or % of water and make really beautiful anatomy models. Adding a shot of iodine dye intravenously allows the vasculature system to be shown perfectly to the smallest vessels. But still not as overwhelmingly gob-stoppingly amazing as a butterfly emerging from a chrysalis! But “man” has only been inventing for perhaps 4 million years! Not long in the scale of things! Apparently some bones are displaced or have arthritis and pinch a nerve between C7 and T1. However, I am not entirely convinced by the diagnosis and that was my motivation for looking at the data myself. This is true photography as it’s writing with light, not much different from using daylight in an ordinary camera. The difference I see is that no lens is used. Actually, I can also do that for simple structures. It seems that this is a natural ability to some people to a large extent. Of course, I cannot do the level of detail you see here. BTW, the early photographers didn’t need glass lenses either, just the classical pinhole. The X-ray beam going through the body is akin to sunlight going through a delicate butterfly wing lying on a sheet of film! As to compression of nerves, the presentation as CT “slices” should be enough to show whether or not the nerves were compromised by the bone! You might need the study repeated with intrathecal contrast. Certainly and there is no doubt that compression is happening. The real question is why it is so and I think the 3D presentation is quite helpful in that respect as it shows the general orientation and relative positions of individual bones. I already have an MRI scan. I meant a CT scan with contrast and further dye in the intrathecal space. I understood so much, but what would it show me better than mri? Especially advantageous for demonstrating nerve compression! But MRI has new contrast agents and could today be better. I would try to talk to the head of Neuroradiology at the Medical University nearest you. Specially advantageous for for nerve compression! But I already know that the nerve is compressed (a little bit). Wouldn't it be preferable to try to understand why it came to be compressed? I mean: finding out that the nerve is compressed by some kind of bone extension is something, but treating it sends me to surgery to remove the extra bone layer. I'd rather not do that, considering that around that part are to be found all major nerves to my left arm and an artery to my brain. Risk benefit analysis is not so good. Finding out why the nerve came to be compressed opens the door to various conservative techniques with potentially less risk and better long term prospects. The nerve is compressed, but only a little bit. I have discomfort, not acute pain. I had a L2/3 disc slip and compressed nerve, my doc opted for have an OP done. I had and did too much, but I'm very happy with that. Find a capable Osteopath I would highly recommend!! The value of knowing what exactly the extent and cause of the pressure on nerves is utmost. No consideration of treatments should be done before this first stage. Osteopathy is a holdover from early ideas on causation of bone and nerve didease. Whatever is valuable in that discipline will be part of the armormentariumnof the academic neurosurgeons and neurologists. While we may like a friendly and skilled wood carver in a village near Munich, for my BMW, I would want the best engineers the City has. The Universities have the most skilled and experienced neuroradiologists and teams of collaborative surgeons and neurologists.